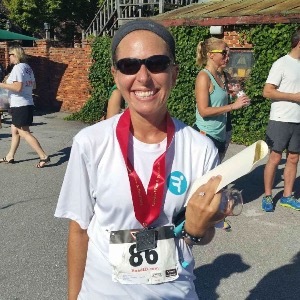 Pauline Juhle PT, MPT, OCS, CSCS, Pn1, Certified Running Coach, FMS Certified is owner and operator of Because We Run, LLC. She is a licensed Physical Therapist and Orthopedic Certified Specialist through the American Board of Physical Therapy Specialties(ABPTS), a Certified Running Coach through the Road Runners Club of America (RRCA), a Certified Strength and Conditioning Specialist (CSCS) through the National Strength and Conditioning Association (NSCA), Precision Nutrition Level 1 Certified, and a Functional Movement Specialist. She is a long distance runner herself, participating in races of various distances of which the half marathon is her favorite. She has been a personal trainer for 13 years and worked in the outpatient orthopedic setting as a physical therapist for 11 years but recently stepped away from her role as a physical therapist to focus on growing her business. Success. Coach Pauline Juhle has been notified of your message.